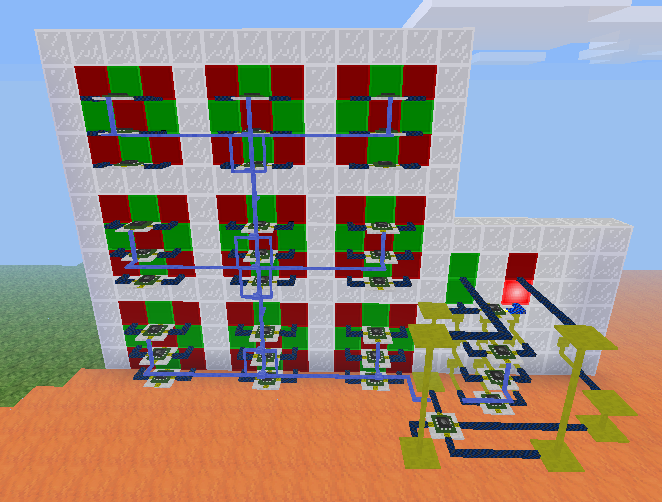 This article assumes you have the Digilines mod, which I generally consider a de facto part of Mesecons. 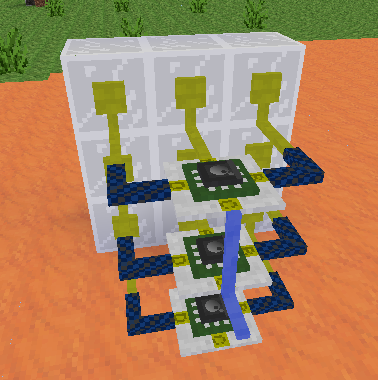 It is still possible to complete it without this mod, but replacing its functionality with fancy wiring is an exercise left to the reader. Having WorldEdit is helpful as well. Unless you've been living under a rock five hundred meters below the surface of Europa, you've probably heard of tic-tac-toe. Maybe. In any case, I won't be explaining how it's played; if you care to refresh your memory, here's a lovely Wikipedia article. Better? Better. Tic-tac-toe is a nice game to build - the rules are quite simple, so we can focus more on the aesthetics and design rather than worrying about the little details. A screen that shows the current state of the game - the three by three grid of X's, O's, or blank. A way to actually enter moves into the game. 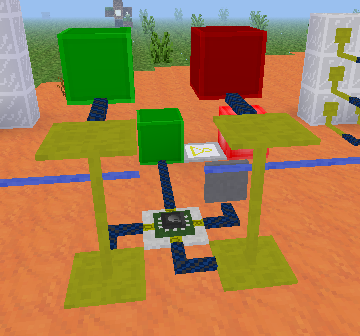 A turn system, which only allows one player to move at a time, and alternates between the two players. 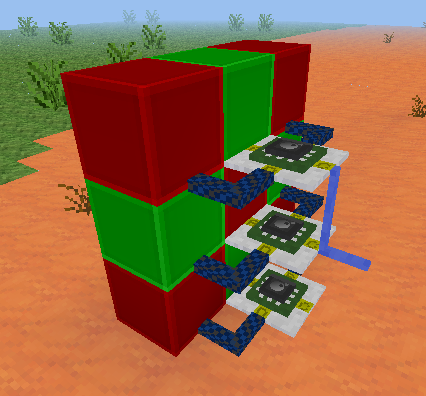 In the interests of simplicity, we will be building each component separately. In the end, everything will be linked together to make the final game. The screen is a good place to start. After all, it's where players will check on their progress. We want to make the screen as seamless and useful as possible. Our Luacontrollers have port A is facing the lightstone, and port C facing the back. If you made it in a different orientation, simply replace the port names with their rotated equivalents. For example, port.b would become port.c in the code if you built the machine 90 degrees clockwise from the orientation used here. You'll notice that the cell now responds to a digiline signal on the "set11" channel. The channel message, being one of the numbers 0 to 3, set the cell to blank, X, or O, respectively. Before we continue, I should explain the way the screen works. 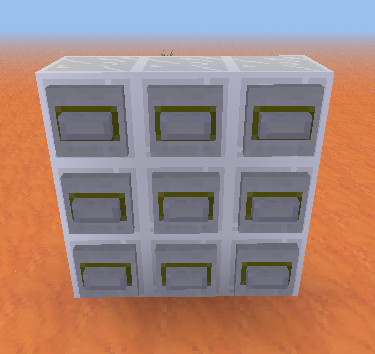 The idea is that there is a single digiline conduit leading out of it, on which you can send a digiline signal "1" on channel "set23" and have the cell in column 2, row 3 be set to X (remember, 0-3 denotes blank, X, and Y, respectively). I also added a border, so the players can distinguish between individual cells, and wired together the digilines for each cell. 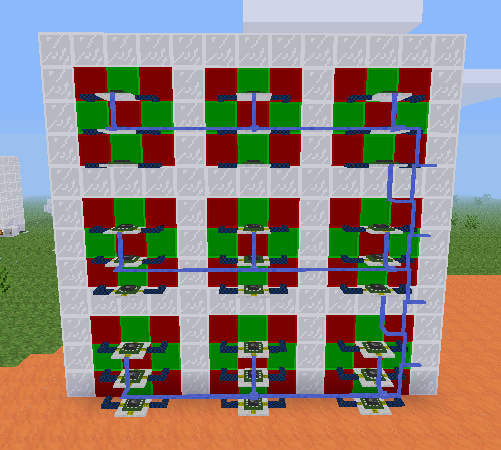 Now we can control the whole screen using only one digiline! The only thing changed from the original cell is that "set11" has been replaced by "set32" in the Luacontrollers, representing column 3, row 2. Port A is facing the steel block wall. As you can see, each Luacontroller is responsible for one row of buttons. When a button is pressed, a digiline signal is sent identifying which button it was. Recording the moves each player makes. Checking for win conditions and displaying winners. Showing who's turn it is while playing. Sending the reset signal when necessary. I've sparsely commented the code, but pin B clears everything, port A is the current turn (off for player 1, on for player 2), and port C and D represent whether player 1 or 2 has won, respectively. The button is connected to pin B, so it will cause the machine to reset. The digilines from each part are connected to the master controller. To prevent the messages from the keypad interfering with the screen, separate the digilines so that the "press" signals don't get sent there. Congratulations! 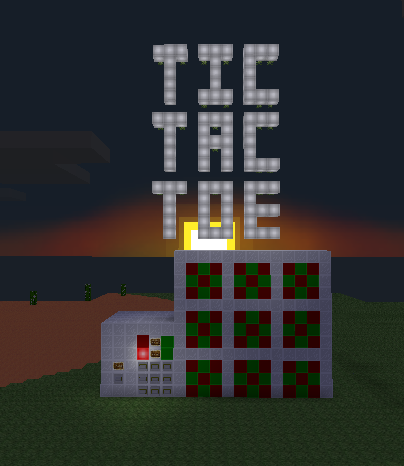 You have a working tic-tac-toe machine! 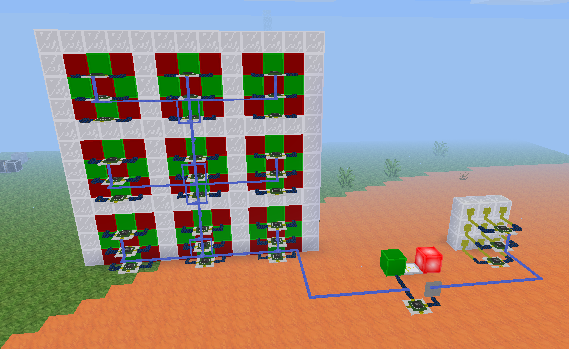 Here I put the win indicator lights above the turn lights, and compacted the wiring a lot. Also, a nice seamless front panel with signs explaining how to operate the machine. Compaction is done simply by moving the parts, which are quite compact by themselves, closer together, to make a smaller overall circuit. The result is a nice thin display, with a tiny control unit off to one side. Not to mention an interesting showpiece to have in your game world.